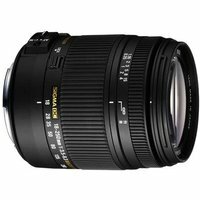 With the Sigma 18-250mm f/3.5-6.3 DC Macro HSM (Sony fit) zoom lens, high-quality images are assured across its zoom range. Despite its small dimensions, the lens boats a Hyper Sonic Motor to ensure fast, quiet auto-focusing and Super Multi-Layer coating to reduce flare. It also has a minimum focusing distance of 35cm, making it perfect for both distant subjects and close-ups. As a lightweight, compact all-rounder, Photography Monthly picked out the Sigma 18-250mm as its super-zoom winner saying that it's nicely screwed together, offers assured focusing, sound shake reduction and decent optical quality'.